Draft: 2015, Arizona Diamondbacks, 1st rd. Resides in Nashville, Tenn., and is actively involved with the West Nashville Dream Center during the off-season...Enjoys participating in various off-season charitable events during the holidays in Nashville and Atlanta... In his spare time, enjoys writing, cooking and playing with his dog, Bentley. Played in 136 games in his second full season, and batted .238/.304/.395 with career highs in hits (114), doubles (25), triples (4), home runs (14), RBI (59) and stolen bases (10) ... Finished with 11 defensive runs saved, the sixth most among major league shortstops and 11 off the lead of Arizona's Nick Ahmed ... Swanson's UZR/150 of 6.1 was the second-highest mark among National League shortstops...Only St. Louis' Paul DeJong (8.6) was better ... Batted .315 (57-for-181) with seven home runs in the seventh inning or later ... In late-inning pressure situations, hit .402 (33-for-82) with three homers, a .427 on-base and a .622 slugging percentage ... Finished the year with 14 home runs, the most by a Braves shortstop since Andrelton Simmons hit 17 in 2013…Since 2000, only three Atlanta shortstops have hit more in a single season(Simmons, Rafael Furcal - 15 in 2003, Alex Gonzalez - 15 in 2011) ... Swanson hit two, two-run home runs on 8/21 at PIT for his first career multi-home run game...He became the first Braves shortstop to hit multiple home runs in a game since 9/22/13, when Simmons hit two at CHC ... Capped a six-run ninth inning on 5/20 vs. MIA with a two-run walk-off single…The rally was Atlanta's biggest ninth-inning comeback since a seven-run rally on 5/20/10 vs. CIN, exactly eight years prior ... The game-ending hit was the second of his career and the first since 4/17/17 vs. SD ... Hit .285 (55-for-193) with runners on base, compared to .207 (59-for-285) with the bases empty ... Was placed on the disabled list from 5/4 to 5/19 with left wrist inflammation…Missed 13 games ... Left 9/25 at NYM with left wrist soreness... Underwent an MRI in Atlanta the next day which revealed a partially torn ligament in his left hand... Did not play for the remainder of the regular season ... Following the season, underwent a procedure to remove a lose body in his left wrist on 11/5… Braves head physician Dr. Gary Lourie performed the procedure in Atlanta. In his first full MLB season, played in 144 games, with 135 of those as the starting shortstop…Hit .232 (113-for-488) with 23 doubles, six home runs and 51 RBI...Had a .312 on-base percentage... Made his first career Opening Day roster and hit .213 (69-for-324) in 95 games before being optioned to Triple-A Gwinnett following the 7/26 game at ARI… Following his return from GWN on 8/9, went hitless in his first 11 at-bats before batting .282 (44-for-156) with a .376 on-base percentage in his final 47 games of the season... Among National League rookies, ended the season ranked third in walks (59), fourth in runs (59), fifth in hits (113), fifth in doubles (23), seventh in total bases (158), eighth in RBI (51), and ninth in extra-base hits (31)... Had a .965 fielding percentage (20 errors in 572 total chances), this highest mark for a qualifying Atlanta rookie shortstop in franchise history…Also logged the most innings with 1,202... Batted .291 (34-for-117) with runners in scoring position, and .280 (21-for-75) in close and late situations...His average with runners in scoring position was third best among Atlanta batters, and the best for a Braves rookie since Jason Heyward hit .306 in such situations in 2010... Hit .305 (30-for-98) with a .355 on-base percentage in 28 June games…Followed his .125 (6-for-48) average in 17 July games with a .309 (21-for-68) average in 21 August contests…His .422 on-base percentage during the month of August ranked 10th-highest in the NL... His on-base percentage vs. opposing left-handed pitchers was .352 and his average was .263 (25- for-95) over 108 plate appearances... In his 11 games with GWN, started nine at shortstop and his final two at second base... Collected at least one hit in nine of his 11 games (.237 average, 9-for-38) with two extra-base hits and five RBI while reaching base at a .356 mark. Entered the 2016 campaign as Atlanta's No. 1 prospect and went on to make his Major League debut on 8/17 (2-for-4) after spending the first four-plus months of the season playing for Atlanta's Advanced-A and Double-A clubs...In his first season in the organization, played in a total of 143 games between three different levels (Carolina, Mississippi and Atlanta)…Batted .281 (152-for-540) with 32 doubles, 72 RBI and 88 runs scored…His on-base percentage at the minor and Major League levels was .362 and .361, respectively...Had his contract purchased on 8/17 and made his Major League debut that evening when he started at shortstop and batted in the No. 8 spot in the lineup...Went 2-for-4 in his debut to become the 14th Atlanta Braves player (since 1966) to record at least two hits in his MLB debut... Finished the 2016 campaign with 129 at-bats and thus retained rookie status for the 2017 season...Hit an inside-the-park home run for his first career home run, 9/6 at WSH becoming the second Atlanta player to do so joining Paul Runge (7/28/85)...Added his second home run the next night, 9/7 at WSH to become the eighth player in Atlanta franchise history to hit his first two home runs in consecutive games...Among rookies with at least 120 at-bats, his .302 average ranked sixth highest in baseball, while his .361 on-base percentage was eighth highest ...Batted .338 (26-for-77) with nine extra-base hits, a .409 on-base percentage and 15 runs scored in his final 24 games of the season (9/4-10/2)...Finished the season with 39 hits in his first 37 career games, the most by a Brave through his first 38 career games since Jeff Francoeur had an Atlanta-record 49 ...Over his final 23 games of the season, 9/6-10/2, posted a .351 (26-for-74) batting average with a .417 on-base percentage and 15 runs scored…In 15 games prior, 8/17-9/4 - the first 15 of his career - hit .236 (13-for-55) with a .283 on-base percentage...Had four consecutive multi-hit games, 9/6-10 (9-for-15, .600)…Finished the season with 12 multi-hit efforts over the first 38 games of his career...Opened the 2016 campaign with Atlanta's High-A affiliate (Carolina) and hit .333 (26-for-78) with 12 doubles, 10 RBI, 14 runs scored and a .441 on-base percentage in 21 games before a promotion to Double-A Mississippi on 4/30... Batted .261 (87-for-333) over 89 games with 13 doubles, five triples, eight home runs, 45 RBI and 54 runs scored with Mississippi …Reached base via hit, walk or hit-by-pitch in 24 of his last 27 games with MIS, while scoring 17 runs... Combined to play in 105 games at the minor league level with a .275 (113-for-411) batting average with 25 doubles, 68 runs scored and a .362 on-base percentage...Attended Major League spring training as a non-roster invitee. May 19, 2018 Atlanta Braves activated SS Dansby Swanson from the 10-day disabled list. May 17, 2018 Atlanta Braves sent SS Dansby Swanson on a rehab assignment to Rome Braves. August 9, 2017 Atlanta Braves recalled SS Dansby Swanson from Gwinnett Braves. July 27, 2017 Atlanta Braves optioned SS Dansby Swanson to Gwinnett Braves. August 17, 2016 Atlanta Braves selected the contract of SS Dansby Swanson from Mississippi Braves. April 30, 2016 SS Dansby Swanson assigned to Mississippi Braves from Carolina Mudcats. April 4, 2016 SS Dansby Swanson assigned to Carolina Mudcats from GCL Braves. 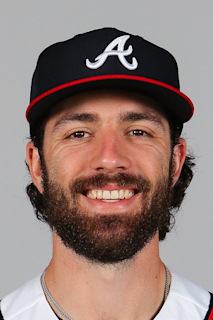 January 7, 2016 Atlanta Braves invited non-roster SS Dansby Swanson to spring training. January 4, 2016 SS Dansby Swanson assigned to GCL Braves. December 9, 2015 Atlanta Braves traded RHP Shelby Miller and LHP Gabe Speier to Arizona Diamondbacks for RF Ender Inciarte, RHP Aaron Blair and SS Dansby Swanson. August 12, 2015 SS Dansby Swanson assigned to Hillsboro Hops from AZL D-backs. July 21, 2015 SS Dansby Swanson assigned to AZL D-backs. July 17, 2015 Arizona Diamondbacks signed Dansby Swanson.